Outspoken Chinese artist and activist Ai Weiwei (shown inside his compound on the outskirts of Beijing) was detained by the government for nearly three months. Now, the government says he owes $2.4 million in taxes and fines. Supporters are sending him money, raising nearly $1 million so far. Last week, supporters delivered donations over the wall of Ai's compound in Beijing — 100 yuan notes folded into paper airplanes. 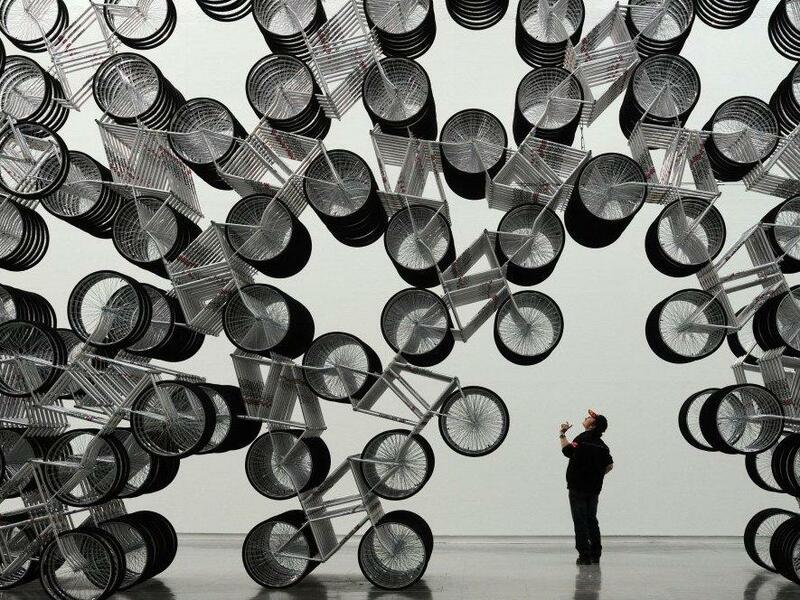 A man admires Forever Bicycles, a work by Ai Weiwei, at the Taipei Fine Art Museum last month. The Chinese government slapped artist Ai Weiwei — one of China's most famous dissidents — with a $2.4 million tax bill last week. The move was widely seen as punishment for Ai's relentless criticism of the Communist Party. Since then, in an outpouring of support rarely seen for a government critic, thousands of people have loaned Ai nearly $1 million to help pay the fine. Earlier this year, the government detained the internationally known artist and activist for nearly three months on what it said were tax evasion charges. Now, he is back at his home on the outskirts of Beijing. After the tax bill became public last week, Ai's supporters on China's version of Twitter fueled a deluge of generosity. Ai says more than 23,000 people have sent in money through bank transfers, cash and PayPal. "This has happened beyond my expectation, and I could never imagine. Even today, it doesn't sound real," says the artist, a mountain of a man with a long salt-and-pepper beard. Ai says the police have called him in and urged him to begin paying his fine. "They said, 'Just pay it.' They said, 'You already have some money. Just pay a little bit. It shows you're willing to pay,' " he says. Ai says he thinks people are sending money to support his bold attempts at free speech — and because they don't like how the government is treating him. "People started to release their anger [by] sending their money in. They just send their money as a voting ticket," he says. It's a means of protest and a way to show solidarity. The loans — Ai insists he'll pay them back — have kept volunteers at his studio busy for days. They scan in bank transfers and log them on computers. Liu Yanping, a friend of Ai's, reads some of the messages that accompany the loans.
" 'I'm lending money to the Chinese citizen I most respect.' 'I'm lending money, pay me back in the next 99 years,' " she reads. Liu opens a glass cabinet and points to a plane made from a red, 100 yuan bill. Worth $16, it sailed in over the wall of Ai's compound. "It was the night of Nov. 5. No one was here. Somebody wanted to give us money. When we came in the next morning, Lu Qing — Ai Weiwei's wife — discovered eight paper airplanes on the ground. It totaled close to $100," Liu recalls. The Communist Party doesn't like the latest attention Ai is attracting. Global Times, a state-run newspaper, suggested the money could amount to "illegal fundraising." Asked about the donations Wednesday at a regular press conference, though, Chinese Foreign Ministry spokesman Hong Lei did not respond directly. "No matter what the people involved do, it can't change the fact that Ai Weiwei evaded a lot taxes," he told reporters. With the exception of Global Times, China's state-run media has reported little on Ai's tax problems. Most people interviewed on the streets of Shanghai on Wednesday seemed oblivious to the case. "I've heard of him, but I don't know what happened to him recently," said one 26-year-old who works for a computer hardware company and refused to give his name. "Sure, they can donate if they want to. It may be the public feels there is unfairness involved. I will not give him money, sorry." 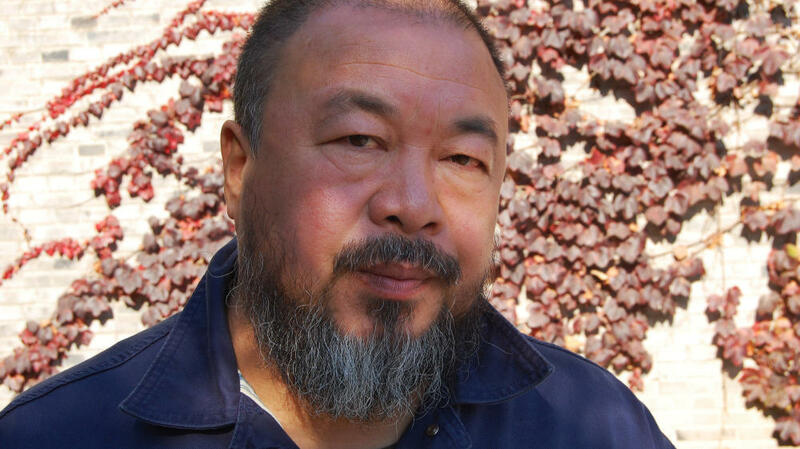 Ai Weiwei is not like most Chinese dissidents. He is a wealthy artist who helped design the Bird's Nest Stadium for the Beijing Olympics. As well, he is the son of a revered Chinese poet, Ai Qing, who was also labeled a government critic and served time in labor camps. Most people of Ai's stature in China are loath to criticize the government in public. But Ai goes out of his way, repeatedly attacking the regime for corruption and political repression. The government has responded by razing Ai's Shanghai studio, holding him in secret detention for nearly three months and now hitting him with the tax bill. Ai says he sometimes finds the battle exhausting — and he has a lot to lose. But he also suggests there is a method to what some in China see as his madness. "It's a game. If I play like this, I may never win, but still the game is going on," he says. When asked whether he thinks the authorities would be smarter to ignore him, Ai replies: "I think it would be much smarter they see me as not existing." Ai says he continues to challenge the government to create space for personal and political freedom. "Freedom is related to every individual's ability to reach out to the truth, to find solid ground for happiness. And those are so important for the younger generation. This is my goal, but don't tell anybody," he says, with a smile. The government has given Ai until next Wednesday to pay his tax bill. Ai says he plans to pay some of it, then appeal his case in China's courts. The fight seems likely to continue — which may be just what Ai Weiwei wants. From NPR News, This is ALL THINGS CONSIDERED from NPR News. I'm Guy Raz. Last week, China slapped one of its most famous dissidents with a $2.4 million tax bill. That move was widely seen as punishment for artist Ai Weiwei's relentless criticism of the Communist Party. Since then, in an outpouring of support rarely seen for a government critic, thousands of people have loaned Ai nearly $1 million to help pay the fine. NPR's Frank Langfitt caught up with the artist at his home today, and Frank filed this report. FRANK LANGFITT, BYLINE: Ai Weiwei was late. He was with the cops. They'd called him in to urge him to begin to pay his fine. AI WEIWEI: Well, they said to just pay - you already have some money, you just pay a little bit. So show us, you know, you are willing to pay. LANGFITT: After the tax bill became public last week, there was a deluge of generosity fueled by Ai's supporters on China's version of Twitter. Ai says more than 23,000 people have sent in money through bank transfers, cash and PayPal. WEIWEI: This has happened beyond my, you know, expectation and I could never imagine. It's, to me today, it still doesn't sound like real. LANGFITT: Ai says he thinks people are sending money to support his bold attempts at free speech and because they don't like how the government is treating him. WEIWEI: People start to release their anger to sending money in. They just send their money as a voting ticket. LANGFITT: What do you think that sending the money means? WEIWEI: It's a means kind of solidarity. It's kind of protest. LANGFITT: The loans - Ai insists he'll pay them back - have kept volunteers at his studio busy for days. They scan in bank transfers and log them on computers. Liu Yanping, a friend of Ai's, reads some of the messages that accompany the loans. LIU YAUPING: (Reading) (Through Translator) I'm lending money to the Chinese citizen I most respect. I'm lending money, pay me back in the next 99 years. LANGFITT: Liu opens a glass case and points to a plane made of a red 100 yuan bill. It's worth about 16 bucks, and came in over the wall of Ai's compound on the outskirts of Beijing. YAUPING: (Through Translator) It was the night of November 5th, no one was here. Somebody wanted to give us money. When we came in the next morning, Lu Qing, Ai Weiwei's wife, discovered eight paper airplanes on the ground. It totaled close to $100. LANGFITT: The Communist Party doesn't like the latest attention Ai has been attracting. Global Times, a state-run newspaper, suggested it could amount to, quote, "illegal fundraising." Asked about the donations today at a regular press conference, though, Chinese Foreign Ministry spokesman Hong Lei did not respond directly. HONG LEI: (Through Translator) No matter what the people involved do, it can't change the fact that Ai Weiwei evaded a lot of taxes. LANGFITT: With the exception of Global Times, China's state-run media has reported little on Ai's tax problems. Most people interviewed on the streets of Shanghai today seemed oblivious to the case. Here's a 26-year-old who works for a computer hardware company. He refused to give his name. UNIDENTIFIED MAN: (Through Translator) I've heard of him but I don't know what happened to him recently. Sure, they can donate if they want to. It may be the public feels there is unfairness involved. I will not give him money, sorry. LANGFITT: Ai Weiwei is not like most Chinese dissidents. He's the son of a revered Chinese poet. He's also a wealthy artist who helped design the Bird's Nest Stadium for the Beijing Olympics. Most people of Ai's stature are loathe to criticize the government in public. But Ai goes out of his way, repeatedly attacking the regime for corruption and political repression. The government has responded by razing Ai's Shanghai studio, holding him in secret detention for more than two months, and now hitting him with the tax bill. Ai says he sometimes finds the battle exhausting and he has a lot to lose. But he also suggests there is a method to what some here see as his madness. WEIWEI: It's a game. If I play like this, may never win. But still, the game is going on. LANGFITT: Do you think they would be smarter to ignore you? WEIWEI: I think it would be much smarter if they just see me as not existing. LANGFITT: Ai says he continues to challenge the government to create space for personal and political freedom. WEIWEI: Freedom is related to every individual's ability to reach out to the truth, to find solid ground for happiness. And those are so important for younger generation. This is my goal, but don't tell anybody. LANGFITT: The government has given Ai until next Wednesday to pay his tax bill. Ai says he plans to pay some of it, then appeal his case in China's courts. The fight seems likely to continue, which may be just what Ai Weiwei wants. Frank Langfitt, NPR News, Beijing. Transcript provided by NPR, Copyright NPR.